My adventurous 5 years old told me why he is not pleased with foods he never tried before on his plate: "I just don't know the taste and sometimes they don't look good", he said. In front of him, parsnip and stir-fried asparagus were the challenge. So I found a way to convince him to explore and taste the unknown territory of his plate. I remembered that in old stories of pirates - currently his favorite characters- they had to eat whatever while on high seas, specially when during a treasure hunt. To add spice to the story I mentioned that some pirates probably had to eat ANY kind of food if captured by enemies, including not so attractive animals and plants. So, he tried it, and actually liked the asparagus but was not pleased by the texture of parsnips. "You remember that I don't like cooked carrots? "- he asked. "Those are just like them", he explained. 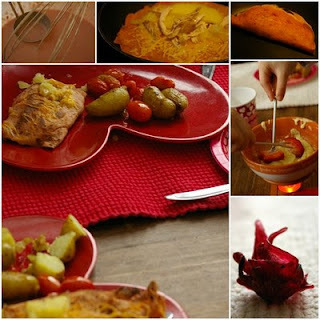 _ Name the Food - They love when the new recipe has a different name, mainly associated with a color or theme. Something like our Ahoy Pink Fish with Tiny Pearls, Rainbow Burritos or the wonderful goodies Darienne prepared for Halloween. _ Explorers Tales - So I tell stories of archeologists like the ones of their Playmobil set, that have to eat the native's foods, not always something palatable for our taste buds. They go crazy when I tell Indiana Jone's story about snakes and monkey brains. _ Go Brave or Go Hungry - I also tell my older kid that if he wants to belong to a Peace mission, be a Medical Doctor or to be in the Army he has to be able to try anything. We have some examples in the family: reporters, soldiers and hospital interns had to eat whatever was available while on duty. Otherwise, I told him, the option is ...to go hungry. 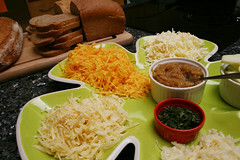 _ Picture Books - Many books related to food were a success when introducing new foods or to facilitate feeding time. Some I read are Bee Bim Bop, Green Eggs and Ham, The Very Hungry Caterpillar, one of the versions of the folk tale Stone Soup just to name a few. _ Supermarket and Fresh Market Expeditions - Sea urchins, live cat fish, lobsters and other sea creatures are the biggest attraction when we visit specialty markets and supermarket fish sections. The boys are totally in awe when they found out that those are edible and also a delicacy for some people. Also, Farmer's Market can be a good place for them to have fun and get acquainted with the seasonal contents of their plate. Few dishes in my repertoire have been subject to as much experimentation as chicken parmesan. The dish is my husband's favorite, and I made it a mission early in our life together to come up with a version that would make him very happy without shortening his life span. 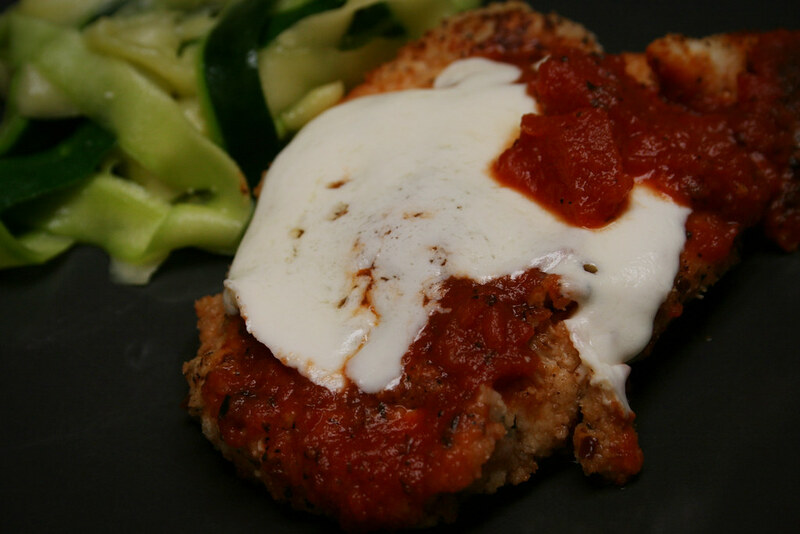 And if I sound like I stepped straight out of a 1950s kitchen in a starched apron, well, I count chicken parm among my favorites as well. I experimented with fresh bread crumbs, nonstick pans, oven-baking instead of pan-frying. We ate a lot of subpar chicken parm before hitting on this version, which slips in a few healthy tweaks but places a premium on taste. I swap out eggs in favor of egg whites (or Egg Beaters), use white whole wheat flour, and add a spoonful of flaxseed meal that goes unnoticed. In my mind, these adjustments more than make up for the indulgence of a bit of fresh mozzarella draped on top. For a midday meal, we paired it with zucchini pasta from the New York Times. It's a fun and tasty take on zucchini that can be prepared in a snap. 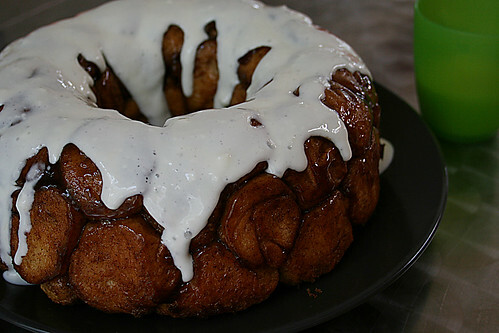 We put the kids to work making dessert: Smitten Kitchen's monkey bread with cream cheese glaze. My boys revved up the mixer early in the morning so the dough could rise before our playdate. Their friends helped make quick work of coating balls of dough in butter and then cinnamon sugar. The hard part was waiting for it to bake -- my 3-year-old spent the better part of the half-hour sitting expectantly at the table repeating: "Did the timer go off yet?" 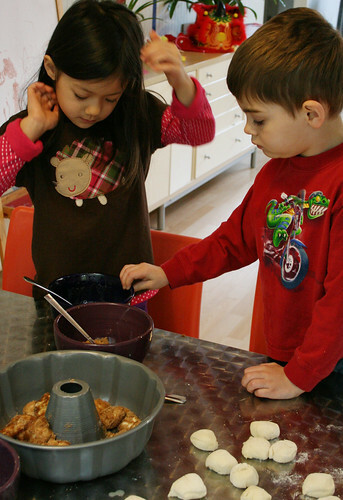 If you haven't tried it, monkey bread is a great project with kids. It tastes like cinnamon rolls -- especially with the cream cheese glaze -- and it's great fun pulling off hunks of gooey, caramel-coated bread. I usually plan for half a chicken breast, maybe a little more, per adult. I prefer a cast-iron pan to a non-stick skillet; use less oil if you go with non-stick, but make sure there's enough to get a nice, golden crust. Trim fat from chicken breasts. Lay chicken on plastic wrap, shiny and smooth side up, and put another piece of plastic wrap on top. Pound gently with mallet or rolling pin to flatten chicken to about 1/4 inch thick. Cut each flattened piece in half. Combine flour, salt, and pepper in a shallow bowl. In a second bowl, beat egg whites gently with a fork. 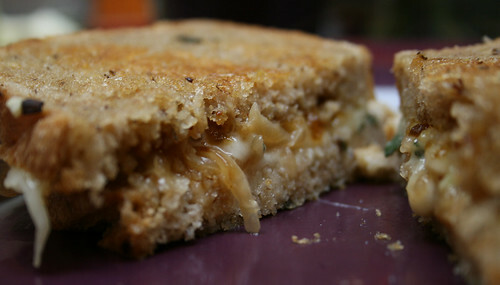 In a third bowl, combine bread crumbs, Parmesan, herbs, garlic powder, and flaxseed meal, if using. Dip each piece of chicken in flour to coat, then egg white, and then bread crumb mixture. Set aside on a plate while you prepare the remaining pieces. Heat a skillet over medium heat. When hot, pour in a spoonful or so of olive oil. When hot, carefully set chicken in skillet. Don't overcrowd the pan; you'll probably need to cook in two or more batches. Cook chicken 3 to 4 minutes, until crispy and golden. Using tongs, flip chicken over and cook another 3 to 4 minutes until no longer pink inside. Adjust the heat if breadcrumb coating isn't crisping (not hot enough) or is burning (too hot). Spread one cup of tomato sauce in a baking dish large enough to hold the chicken. Place chicken pieces on top, then spread the second cup of sauce on top. 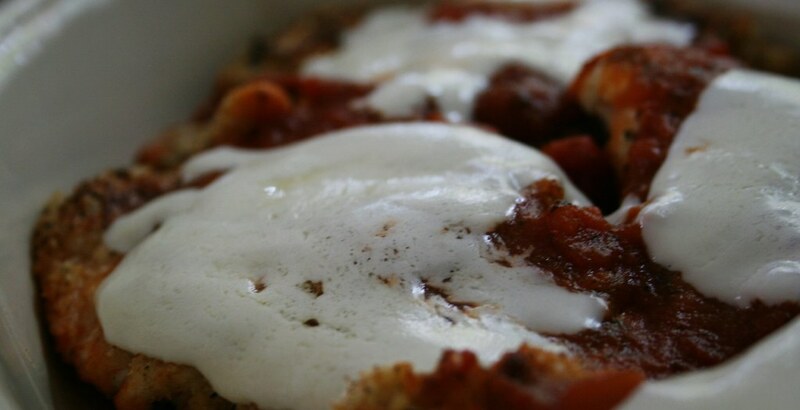 Scatter slices of mozzarella cheese over everything, then place under broiler until cheese is melted. Adapted from Martha Rose Shulman. You could top this with tomato sauce, but I prefer it plain. Use a vegetable peeler to slice the zucchini into long, thin ribbons. Stop when you get to the seeds and throw out the core. Heat a half-tablespoon of oil in a large skillet over medium to medium-high heat. Add the zucchini, sprinkle with a pinch of salt, and cook, stirring gently, for about three minutes until the zucchini softens and becomes translucent. Add salt and pepper to taste and transfer to serving bowl. Sprinkle with parmesan cheese. 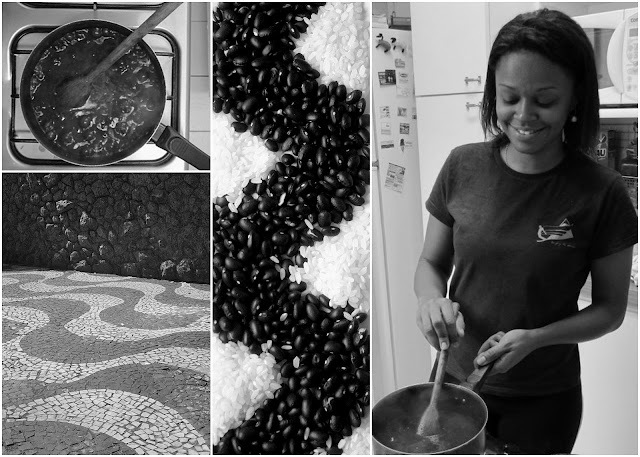 What about sharing your passion for food with your loved ones this weekend? That was the inspiration for this week playdate, a rehearsal for Valentine's Sunday brunch. The intention of spreading the best feelings was in my menu, even though my mostly lovely kids were far from being adorable. Tantrums and arguments about sharing toys, loud and happy voices, and running around were the special of the day. I tried hard to concentrate and put together my project, a simple recipe of savory crepe-pancakes with a gentle filling inspired by Hawaiian pizzas, and the whole mission was looking like a challenge. But against all odds, the crepes ended up being delicious. For dessert, white chocolate fondue, strawberries and sugared hibiscus flowers were highly appreciated by older kids. I was also planning on preparing a cranberry-flavored bubbly to pair up with the meal for the moms, but distractions were so many that we ended up just drinking cranberry green tea. On Sunday I will do it all over again, and hopefully the spirit of Valentine will turn everything very mellow. I used precooked baby beets, which can be found at Trader Joe's. They didn't overshadow the flavor and added a soft pink color to the crepe. The pineapple can be from a can (in pineapple juice) or fresh. Using a blender, mix beetroots and milk until smooth. With a whisker, gradually integrate eggs, oil, flour, cheese, and salt into the mix. Make sure that all ingredients are well combined. Set aside. Heat a medium shallow skillet over a medium flame and coat lightly with oil. When hot, pour in 1/4 cup of batter, tilting the pan to coat the whole bottom. Wait until the edges of the crepe begin to detach from the edge of the pan. Loosen the edges with the help of a spatula, then flip the pancake. When it starts to show small bubbles, add 1/2 cup shredded cheese, 1/2 slice of gouda, 1 tablespoon of pineapple, and 1/4 cup shredded chicken. Close the crepe, roll it, and transfer to a plate. If you want to serve all at once, set the cooked crepes in a ovenproof dish in a 200 F heated oven, cover them with cheese and pineapple pieces, and broil at low for 5 minutes before serving. 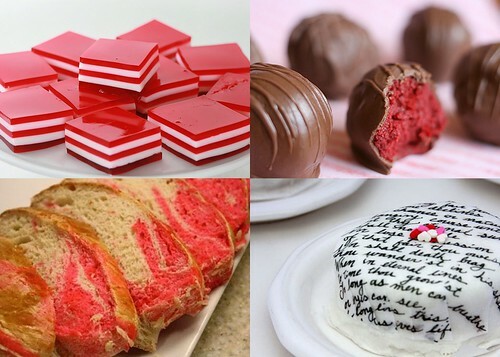 I've been enjoying a virtual sugar high from all the Valentine treats floating around online, and wanted to share a few of my favorites. 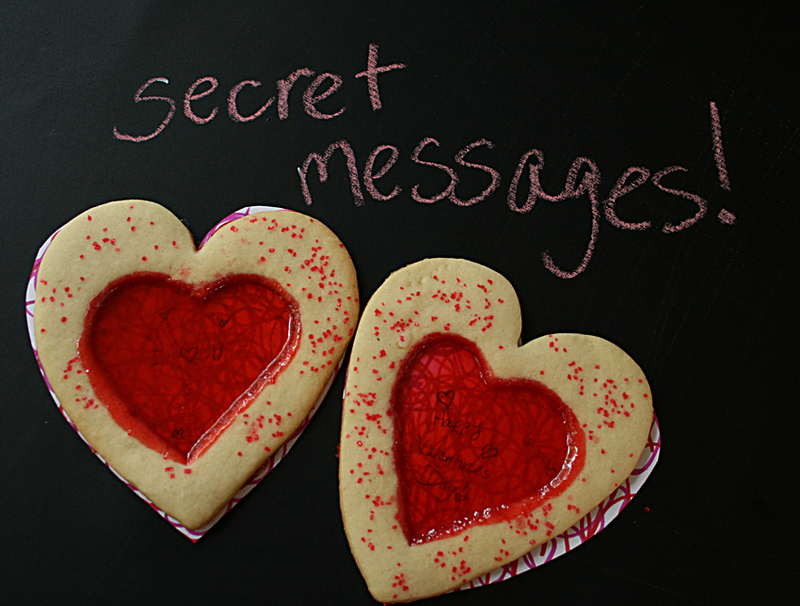 I had to make these brilliant Secret Message Decoder Cookies, posted at FamilyFun. 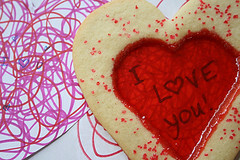 The idea is simple: Cut out the center of a sugar cookie, fill with crushed red candy, and bake. Write your message on paper with blue ink, scribble over it with red, pink, and orange, and magic! You can read the message through the candy "window." I'm going to make a variation of layered Jell-O, beautifully demonstrated by the Food Librarian, for my son's kindergarten party this week. The Red Velvet Cake Balls from Bakerella look perfect for a playdate or Valentine goody bag. The Giver's Log made me swoon with her use of wafer paper -- I love the idea of kids decorating a cake with their own drawings! I have to get my hands on some of that stuff And finally, bread bakers could have some fun with Gourmet Mom on the Go's Tickled Pink Bread. What treats are you planning for Valentine's Day? I'm jinxing this, but here goes: We've enjoyed whine-free meals with our 5-year-old for a couple months now. And he's eating a more varied diet than ever. It's been nothing short of a miracle, so I'll share the secret: We told him he could have plain cottage cheese if he didn't like dinner. He was thrilled. Problem solved. Yep, it was that easy. I read "How Cottage Cheese Saved My Life" over at It's Not About Nutrition (via Fix Me a Snack) and immediately pitched the idea to my son: It can be your choice. If you don't like what I make for dinner, you could have some plain cottage cheese, yogurt, or tofu. No more wailing and complaining. Deal? Yes! he exclaimed. Cottage cheese! As enthusiastically as if I'd announced Handy Manny was moving in next door. Make the backup consistent: Use the same thing as a backup every time, no exceptions. Always have it on hand. Make it nutritious: No appeasing with pointless food. Make it convenient: You're not preparing a special meal -- you're dishing something out in mere minutes. Or maybe your child can help herself. Don't make it too enticing: The backup should be something your child likes, but doesn't love -- think unflavored yogurt, tofu, canned beans. The first time out, my son started to howl about his dinner plate. We reminded him about cottage cheese, and he immediately calmed down and took us up on the offer. A handful of times over the next few weeks, he eyed his plate and politely requested cottage cheese. Even better, this kid -- who used to wail about anything that wasn't pizza or pasta sans tomato sauce -- has been trying all sorts of food. Chili, salmon, black bean burritos, roasted chicken -- even spicy dishes at a Singaporean restaurant. Tomatoes, peppers, onions have been devoured with happy exclamations that he likes them! He hasn't asked for cottage cheese in over a month. I think he's forgotten it's there.